Our company has been successful in winning appreciation from the clients as one of the most prominent names in the trading of Cascade Wooden Blade Ceiling Fans. Remote Control Included: Pull Chain/ Wall Regulator. Additional Remote Can Be Purchased. In order to meet excellent quality standards, we are supplying Wooden Ceiling Fans. 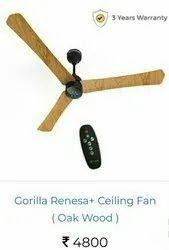 We are amongst the most reputed names in the industry, offering Wooden Ceiling Fans. We offer a high grade collection of Wooden Ceiling Fans which are highly appreciated by the clients for the innovation imparted in them & for being Eco-friendly. Our reputed entity is engaged in supplying Shinto 1200 mm Oak Wood CF. We are recognized as one of the leading traders, exporters and suppliers of Ceiling Fans-Wooden Outdoor Ceiling Fans that are fabricated using superior quality wood and other material. The offered range is fitted with aluminum die-cast motor with double ball bearing which ensures easy and long time usage. We are a top-notch organization, engaged in providing Wooden Ceiling Fan. With our range of best designs of decorative ceiling fans in the market, we have created a place for ourselves in the market and emerged as an eminent supplier of wooden outdoor ceiling fans.